"Karate is my secret, I will not display it to the public. "I pray forgiveness for having used karate in an unmannerly fashion and pray I never have to use it again." This is the salute that is always done at the end of each kata in the shorei-ryu system of karate. Shorei-ryu was developed, or named, about 100 years ago around the mid-1800s by Kanryo Higashionna. Higashionna studied some of the Naha-te techniques of Okinawa and then moved to China. There in the Foochow Province he studied for some 20 years under Liu Liu Ko. But it was not until Higashionna came back to Okinawa that he began to develop the shorei-ryu system. The shorei-ryu system can be traced (though with some difficulty due to the lack of records) to the Sho Dynasty in the 1400s. The main method of tracing it is through some of the shorei kata, which are indeed very old. Shorei-ryu was first brought to the United States in 1946 by Robert Trias, who opened the first karate school in this country then. 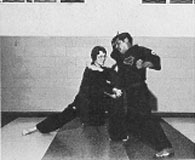 While in the Orient, Trias studied the system under Choke Motobu's chief instructor, Tung Gee Hsing, and learned the Chinese mo-kempo under Hoy Yuan Ping. He then passed this unique style on to many including Philip Perales, who teaches in Orange County, California. Shorei-ryu is associated with the courage class of karate and is primarily an internal system. There is an old saying, "For something to be strong and lasting, it must have a good foundation." 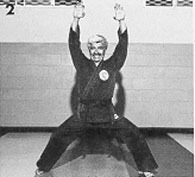 The shorei-ryu system has its greatest emphasis on its foundation: the horse stance. 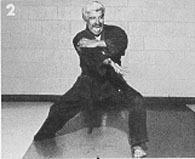 Hours of practice are devoted to standing in the horse stance and the lunge position in the dojo. 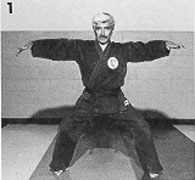 The horse stance must be low to the ground and the shorei karateka must become accustomed to this low center of gravity. It is always much harder to knock someone down the lower he is to the ground. Further, a low stance is usually much stronger than a higher one. For the appropriate progress to be made in the shorei style the foundation must be made stronger and more solid. This form is called the tiger. In ancient times, practitioners would put poison on their fingertips which would cause more damage. The top row of photos is the practice form. The bottom row is the form put to practical use against an opponent. From the starting horse stance (1), the performer raises his arms (2) and then forcefully attacks the foe's eyes (3). The next move (4&5) is simply pushing the dazed opponent away. The shorei stylist will practice many times from a low stance. This will strengthen both his internal and external power. For when one works on the internal power (chi kara) the external flows more freely and more naturally. 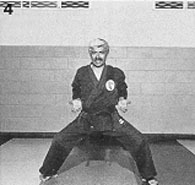 Some of the exercises performed from the low horse stance are: the karate five-count, the six-count, the Okinawan punch to the groin and outward chops from the neck. The next important aspect of the shorei-ryu system is the practice of kata. Aside from the horse, there is nothing which has as much importance as the practice of kata. Kata itself is the center of all karate and classical kung fu. Kata contains all of the necessary ingredients for drawing one closer to the center of himself, and, consequently, closer to the source. Kata is, in fact, very metaphysical. It is designed to expand the total individual and to increase his awareness in order to bring the best out of him. The word kata, translated, actually means "dance." Symbolically, a dance is the harmonious mental and spiritual activities exercised in accordance with a governing principle. This governing principle: a return of the individual back to the source, his deeper self or god. In order to use kata to its greatest advantage one must constantly practice. It takes time, work and patience in order to become proficient at kata and at the martial art itself. There are many who would, and do, try to refute the importance of kata today. Statements are made such as, "Kata doesn't hit back, so it has little value to me. Besides, it's boring." It is unfortunate that these ideas are so prevalent, for all they show is that individuals are narrow-minded and are not tapping their full potential or that of the martial art they teach or study. In the shorei-ryu system, kata is done as though one were really in a combat situation against any number of foes. The moves are done with power, speed and timing. Concentration is at its maximum, and when the person becomes proficient he/she should be able to do the movements completely without thinking. The proficient shodan in the shorei system should be able to perform a kata against an opponent and should also know and understand each application. 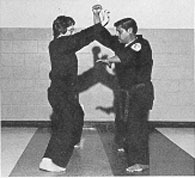 The shorei instructor will scrutinize the student's kata by watching the breathing technique, the stances, the sense of direction, rhythm, shifting and walking, the body movements, form, speed and power. 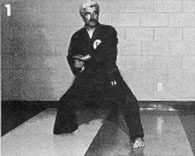 The shorei-ryu system also has kata which are unique to the system, not found in other karate styles. These are the Omoto kata. They concentrate on the basics and the formation of power. Each has either four or five moves. They are done in a low lunge stance, moving forward and back many times. They are designed to increase the strength of the stance and the stamina and internal strength of the karateka. They were originally developed by the Naha-te masters and passed on throughout the years. Some of the authentic shorei kata are: gopei-sho, mandan-sho, yoko sho, buto, nafun-chee (tekki), and sanchin. This last kata was formulated by Higashionna, although he probably obtained the idea from his teacher Liu Liu Ko in China. The sho kata date back to the 1400s, when Okinawa was governed by China and Hashio of Chuzan was in charge. Gopei-sho, the peacock form, probably best demonstrates the use of animals in the shorei style. It makes use of the tiger, snake, crane and peacock, nearly as in their original Chinese forms. This kata is meant to be one of continual flowing power. 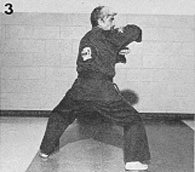 This is another variation of the tiger kata. Once again the performer attacks with the fingertips from a very low stance (1). Then the elbow comes into play against the foes face at the same time a punch is thrown to the oppo- nent's stomach (2&3). This movement may lack the precision and grace that kung fu is noted for, but it makes up for it with raw power. 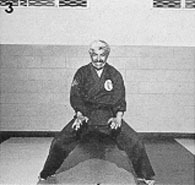 Another type of kata that was developed by the early shorei masters was the taezu naru waza. 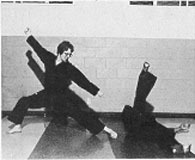 More than likely, these two-man sets were a combination of ideas that were carried over from the Chinese masters of the Shaolin temple in the original kosho-ryu (old pine forest). The taezu naru waza are very similar to the two-man fighting sets taught in Chinese kung fu. One man will act as the attacker, and the other as the defender. These forms are practiced to increase the karateka's speed and power. They contain circular movements, sweeps and forward moves. They are to be done in no more than three seconds, and some of them contain up to seven moves-and some of these are double-one-hand techniques. They contain many of the basics and some of the animal hand techniques and are an important part of the training regimen for the shorei stylist of what ever rank. They are used primarily for close in-fighting and give the karateka a variety of self-defense moves that can be applied in a real street situation. 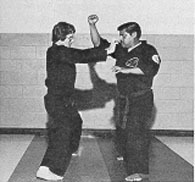 In the early days of the shorei style, and even in some dojo today, students would work on their punching techniques by punching or thrusting their hands into jars filled with various minerals. First, the young practitioner would practice his punching into a jar filled with sand. Then, as time went on, he would progress to a jar filled with beans. Finally, he would work with a jar filled with gravel. The purpose of this was to strengthen and develop the student's kime (focus) and develop the hands into effective fighting tools. Another method of developing the hands was the use of the makiwara board, which was merely an alternate form of this practice. Many hours of practice on the makiwara board developed the chops and punches of the student. By now, you are probably asking yourself about sparring as a training technique. 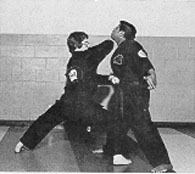 Simply put, sparring is practiced in the shorei system but it is used only to aid the student in the application of the techniques found in the kata. By using these techniques the individual gains knowledge of his progress in the form and the system. He sees that what he is studying can be put to effective use against an opponent. He learns to flow and follow through on his movements, and he learns to relax. Relaxation is an important part of any fight. One must remain relaxed in order to interpret the first move of the opponent. This is true for most styles of karate. However, in the shorei system, the person's chi is of great im- portance during the confrontation. When one is trying to anticipate another's movements, it is easy to tighten up, to miscalculate the opponent's move and lose positive chit Remaining calm produces a balanced mind, and a balanced mind flows freely from thought to action. 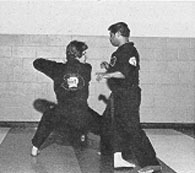 Although sparring is not the most important aspect of shorei-ryu, fighting techniques are practiced in the dojo. 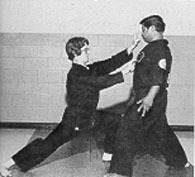 Many of the fighting techniques are performed by moving into and to the side of the opponent. By doing this the karateka gains a variety of options. Once inside the opponent's guard, the hands are most often used. Yet the rest of the body cannot be overlooked. You must remember that you can use the head, knee, elbow and the heel of the foot. But the shorei system is, in essence, a hand system. 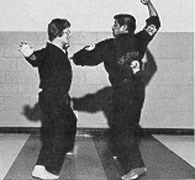 The most common and most widely used hand techniques found in other styles of karate are employed, of course. However, a skilled shorei practitioner will also use the circular hand movements commonly found in the Chinese five-animal systems. The traditional shorei stylist will work long hours on his blocks. Whereas in the Japanese styles one has mainly powerful and effective straight blocks, shorei-ryu also makes extensive use of circular blocks. 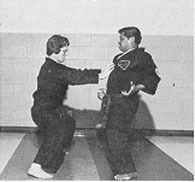 Thus, ideally, one downblock can become two blocks, blocking both a punch and a kick, and leaving the other hand prepared for countering, defending, or some other technique. To practice, the blocks are practiced in low stances, and instead of exhaling as in most systems when doing the block, one inhales. Then when executing a counterattack, one will exhale and tighten up at the last moment prior to impact. 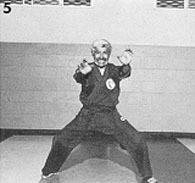 In the early days of the shorei-ryu system in the United States, Trias would use a tool similar to the choy li fut wooden dummy. It had a wooden center, with one moveable arm attached to its side. In this way the student could practice his blocks either up or down and at the same time work on the form as well as building up power. Kicks in the shorei system are usually done no higher than the abdomen. The idea of that is that when one kicks high the chances of losing balance, or of the kick being caught, increase vastly. Besides, kicking high tends to cause a loss of power. When practicing the geri waza, in order to maintain a good foundation, the balancing leg is kept on the ground with the heel pressed firmly down. Flexibility is important, as is the recoil of the kick. It is necessary that the kick be drawn back like a recoiling snake after the strike. This kata is another part of the gopseisho. 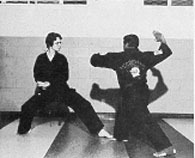 Notice the low stance (1&2) and hard technique. The shorei stylist will practice many times from a low stance. This strengthens both his internal and external power. Power is substituted for grace. 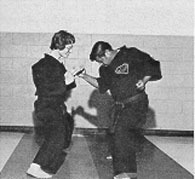 In the United States today, many dojo emphasize fighting and self-defense. It is true that in the days when Okinawans had no weapons and were being oppressed by their feudal lords, they did have to learn to defend themselves. Yet, as time went on, karate became a practice of relaxation and harmony of the mind and body. The great Okinawan masters such as Higashionna, Miyagi and Motobu found that discipline of the mind and body through karate could be carried on into daily life. Shorei-ryu stresses the scientific aspect of karate. By disciplining the mind and body, the person remains calm and unified. By constantly practicing mind and body unity, the person is better able to deal with simple daily confrontations. Although it is still true that the best way to deal with confrontations is to avoid them, when one is in harmony with oneself even unavoidable confrontations can be dealt with rationally and calmly. For the shorei student, it is important to master his own mind and body before attempting to conquer someone else. With the emphasis on fighting in many dojo today, this falls by the wayside and is forgotten. Zen holds a very high place in the shorei system. It is through Zen that the student can become more aware of himself and of that which surrounds him. One way of achieving this is by working on breathing exercises. In shorei-ryu the breathing exercises are based heavily on the Zen principle of mushin (no mind). By working on shita hare (seika tanden) one develops not only the physical body but the internal energies simultaneously. The very strenuous sanchin exercises which concentrate on every muscle in the body gradually produce a very relaxing effect on both mind and body. 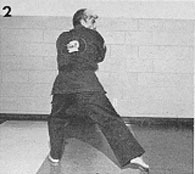 These exercises, seika tanden, sanchin and the Zen principles are not new to the martial arts, but in many they schools have been done away with. In essence, their principle is to clear the, mind cleanse the inner and outer body, strengthen the chi kara, and allow the open mind to absorb all that it can. It is important, therefore, to always think clear yet positive thoughts. Negative thoughts cloud the mind and weaken the internal, as well as doing great damage to the physical body itself. Thus it is that the mind directs all that the physical body does, and if one works hard enough (although it is not an easy task) one can attain mushin and find harmony. To quote the masters, "Thought during action is an obstacle to harmony and unity." In the shorei system all these principles are brought together in the practice of kata. About the Author: the information in this article draws heavily on notes give to Robert Trias by his teachers, Tung Gee Hsing and Hoy Yuan Ping and passed on to Philip Perales. 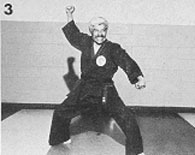 Philip Perales hold an eight-dan in the U.S. Karate Association and is founder of the California Federation of Black Belts. He studied under Robert Tiras beginning in 1980. 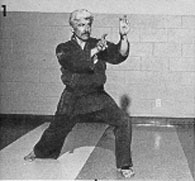 Scott Wiseman holds a second-dan, and has studied under Philip Perales since 1970. Copyright (c) 1997, Blackbelt Communications, Inc. ALL RIGHTS RESERVED.